With Xmas around the corner, getting a long run in is becoming quite the challenge. On top of the usual, my sister was coming to visit yeasterday, so desperate times call for desperate measures. Yesterday (Monday) morning, I got up at 2AM (yes, 2) and by 2:30 I was driving toward Boyne Valley National park for a 5 hour walk/snowshoe/run in the snow. There is ZERO snow in Toronto and I wanted to make sure tthat wherever I went had a decent amount, so North I drove. I got there around 4Am and had a bit of a challenge finding a good spot to park, as all the "official" parking spots appeared snowed in. Success, at least there's snow! It is a weird feeling to stand by the car in the darkness at 4:30AM, in the middle of nowhere. 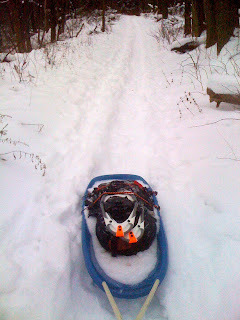 I got "Sancho" the sled out, strapped my snowshoes and backpack in and got going. Because of my current injury (that seems to be getting worse instead of better), I didn't plan on running much but I wanted to test the other components of the race: the sled, water delivery, clothes, ligths, navigation. I didn't bring my stove and other cooking gear, I'll try that next time. The plan was to walk 15/run 5 but that didn't happen. The trail was very rarely flat and quite narrow. Running downhill with a sled trying to pass you is a bit of a challenge so other than flats and very gentle downhills, running opportunities were far and between. 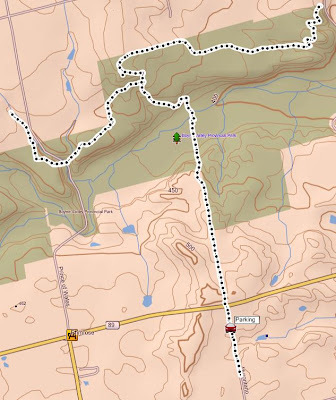 The problem with the Bruce trail is that it's on the Niagara Escarpment. 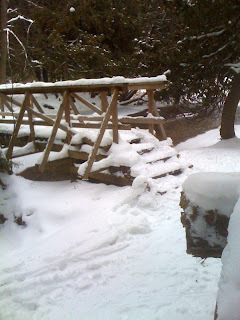 While it's nice for hiking, for runners it makes the trail a bit too challenging. The only thing worse than pulling a sled up steep snowy swithbacks in the dark is going DOWN hills steep switchbacks with a sled falling down the hill or turining upside down at every turn. Because the ropes are encased in two PVC tubes to prevent the sled from crashing into me, every time I had to interact with the sled, I had to remove my belt. I swear I had to do that at least 20 times. Lesson learned: don't leave anything in the sled that you are not willing to lose if your sled slides down a cliff and the content empties into a river. I got my keys back into my pocket after the first near disaster. I never lost anything, but it could have happened. I wore my Nathan vest to see what would happen in the cold. It was about -7C (19F), so not cold, but still a bit nippy. The water in the tube started freezing after about an hour. At that temperature, you basically wear very little (I had my base merino layer and a light merino mid-layer) so you can't really wear the vest under a jacket. I was able to keep the tupe from freezing by tucking the tube and valve into my second layer but there was a section that was uncovered, but it didn't freeze. If it had gotten much colder, I would have added a fleece layer over the vest and kept all that tubing out of the cold. Anyway, I'm brining the vest. At the very least, I can put two thermos bottles in there instead of the bladder. Anything to not have to get to the sled. My brand new, slightly-oversized-to-wear-warm-socks, La Sportiva Crosslite worked flawlessly. I never even thought of taking my Microskpikes out. I had fantastic traction with the shoes alone on packed snow. I guess if it ever got cold enough that I had to wear the overshoes, part of the sole would get covered and the Microspikes would be necessary. That, or just ice. Anyway, I'm happy I got a new pair of Crosslites. I used the snowshoes two times, for a total of about 40 minutes. The snow was very light and the snowshoes worked well, but they are racing snowshoes, and I have a feeling that they wouldn't work so well in deep snow without a firm trail underneat. That won't be an issue. A few hours going up and down steeep hills, my left knee started bothering me. It never got truely painful, but that prevented me from running more than a few minutes at a time. I was hell bent on not letting the pain get out of control. I had to be able to get back to the car! I pushed my "OK" button on the SPOT a few times and got the email on my iPhone in short orger. I put the SPOT on top of my bag, on the sled, and that gave it a perfect view of the sky and minimal rocking motion (except when the sled flipped over, of course). That worked perfectly. I'm happy with the SPOT. It was dark until about 7 or 7:30Am, so I had almost 3 hours in the dark. I quite enjoyed it. I might have to upgrade my frontal light. I have a Zipka Plus headlamp with the retractable cord. It's tiny and I just throw it in my bag. I think I could do with a bit more light though. I also have a handheld, which is very powerful so I always had enough light. You need two lights. After day break, I saw a few deers and even a "flock" of wild turkeys. What a racket! I can't believe these animals can fly. They are as big as a dog. I did find a good 4km loop, called the "Primrose loop" where I was able to get some decent running in. If I need a good spot training, I will go directly there. Hopefully we will get snow closer to Toronto though. Total time 4:45. Not much running. A lot of learning. Left knee not doing well. I'm very worried. I decided to not run at all for ten days. I'll do as much elliptical as I can. I need to put a lot of hours in so I don't lose any fitness. In ten days, if I still can't run, I will probably have to make a difficult decision. Hopefully, that won't happen. Sounds like a great time. Keep on the elliptical, and we are all praying for the knee. Hope the knee is coming along okay. Cya on the trails in the spring. Are you going to run Seaton? Hey Chris, I'm pretty sure that I will be there, probably for the 52K. I want to keep some in the tank for Sulphur! David, thanks for the good thoughts, it looks like it worked!